GREENVILLE - Glenda R. Simmons, 85, of Greenville, died Wednesday, April 23, 2014 at 10:20PM at Owensboro Health Regional Hospital. Mrs. Simmons was born October 23, 1928 in Ohio County. 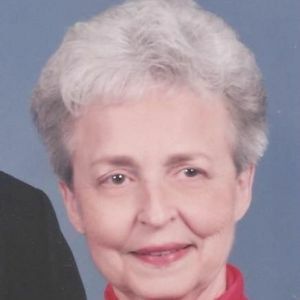 She was a teletype operator at Braniff Air Lines, and was a cataloger at Muhlenberg County Library. She was a member at First Baptist Church in Greenville. She was preceded in death by her son-in-law, Reginald Glenn Shanks; and brother, Charles Stevens Russell. Survivors include her husband, Tommy Simmons; daughters Paula Simmons Shanks of Owensboro, Lisa Simmons (Steve) Dukes of Central City, and Malinda Simmons (Greg) Pierce of Elizabethtown; grandchildren Rebekah Shanks, Russell Gardner, Amelia (Brian) Balentine, Andy (Meghan) Dukes, Sammy (Sharen) Dukes, Ian Pierce, and Kate Pierce; and great-grandchildren Lance, Max, Ana Kaa, and Lily. Funeral services will be Monday, April 28, 2014 at 10:00AM at Tucker Funeral Home in Central City, with Rev. Harold Simmons officiating, assisted by Rev. Daniel Selman. Entombment at Rose Hill Cemetery in Owensboro. Visitation will be Sunday from 2-6PM at the funeral home. Expressions of sympathy may take the form of contributions to Alzheimer's Disease Research. Envelopes will be available at the funeral home. Online condolences may be made at www.tuckerfuneralhomes.com. The beautiful and interactive Eternal Tribute tells Glenda's life story the way it deserves to be told in words, pictures and video. Tommy, You and your family will be in our thoughts and prayers. Paula. So sorry to hear of your loss. Thoughts and prayers to you and Rebekah. Glenda was one of the sweetest and kind ladies I knew. Always a smile and always busy doing something. The kind of person we all wish we could be.. I have lovely memories of your sweet mom. Prayers of peace to your family.